The Fiat 500L MPV has sharpened up its act. Jonathan Crouch looks at what's now on offer. Fiat has its own 'fortune 500', a little family of cars on which present and future hopes of the brand are these days almost exclusively based. The 500 we all think of is the cheeky little three-door citycar that started this model's retro revolution but Fiat always felt that this should be merely the starting rung on an ownership ladder designed to be fine for families as well as fashion-conscious urbanistas. A ladder encompassing seven seats and SUVs as well as the model we're going to look at here, the spacious and now much improved 500L. Fiat's fame of course has traditionally been founded on much smaller cars than this - but the brand needs to get better at being bigger if legions of owners of the 500 citycar are not to be lost to other makers as their needs and families grow. Launched originally back in 2013, the 500L aimed to give these people a model to trade up to - but it needed a bit of polishing. That's what's taken place here. You get an urban confidence with the 500L, something encouraged by the light lock-to-lock steering. A car you might enjoy on the school run. If not quite so much pushing on beyond the city limits. Here, you might wish that the steering offered you a little more feedback, a pity because in other respects, this is one of the more dynamically able five-seat mini-MPVs on the market, with a range of willing, torquey engines. Well, most of them are willing and torquey anyway. You couldn't really say that of the entry-level petrol unit, a 95bhp petrol 1.4 that's one of Fiat's older efforts and which, thanks to limited pulling power, doesn't really feel as fast as the performance stats suggest (rest to 62mph in 12.8s on the way to 111mph). Better then, if possible, to find the funds to stretch to one of the other engine options. There's a 120bhp 1.4-litre T-Jet petrol unit, but most customers will want one of the two Multijet diesels. There's a 95bhp 1.3-litre unit, which can also be ordered in semi-automatic 'Dualogic form. Or a 120bhp 1.6-litre powerplant. If you choose your 500L in 'Cross' form, you even get some mild off road ability, thanks to the inclusion of a 'Mode Selector' with a choice of 'Normal', 'Traction+' and 'Gravity Control' settings. 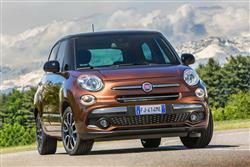 You tend to approach this 500L expecting it to be a pumped-up version of the 500 citycar - which of course it isn't. To make this model as big as it needed to be - fully 60cm longer and 18cm taller than an ordinary 500, so in Fiat terms, longer than a Punto supermini and as wide as a Tipo family hatch - Andreas Wuppinger's styling team had to use a Punto floorplan as the basis for something quite different. Then give the end result a recognisable '500'-style twist, hence the familiar wide-eyed front end. As BMW found when trying to super-size the MINI to create the MINI Countryman, that isn't a recipe for aesthetic elegance - and it certainly isn't here - but it has left room for some very clever touches. Just look at the flow of the wraparound windscreen for instance, designed to give almost 360-degree vision. This improved model has been lightly re-styled and now features LED daytime running lights. Plus the revised front bumper and a chromed-studded three-dimensional lower grille mesh now give the car a more elegant look. Inside, the instrument binnacle you view through the re-styled steering wheel has been re-designed too. As before, this is one of the most practical models in the compact MPV class. Three adults can comfortably sit on the back seat, plus standard models have a 455-litre boot. There's also a 'Wagon' variant with a third seating row if you need it. It isn't only the concept, the size and the styling of this model that's different from the 500 citycar. The price is very different too. The asking figures start from just over £16,000 and buyers are presented with the choice of three main variants - standard 'Urban', the SUV-like 'Cross' model and a 'Wagon' derivative that includes a third seating row. Has any five-seater compact family five-door ever offered more scope for buyer personalisation than this one? We doubt it. There are decal packs to suit every taste and a wider range of paint colours than any compact car has ever offered. Whichever shade you choose, you can contrast it with a different finish for the wheels, the door mirrors - oh and the roof too. Inside, there's a body coloured-painted dashboard offered in five different shades or with beautiful suede trim. You can also specify a two-tone steering wheel and there's a choice of red or grey seat inserts. But of course that's just the start. Fiat promises buyers a choice of over 100 unique accessories in a list that goes far beyond the usual bodykit, stereo and towbar choices. So your 500L might come with a bespoke PC bag, a steel clothes hook, an iPod holder or even a key in your own personal colour. It could even have a coffee maker. Yes really. We can't imagine that 500L motoring is ever going to cost you very much. The 1.3-litre Multijet diesel manages 68.9mpg on the combined cycle and puts out 107g/km of CO2, figures you can further improve to 70.6mpg and 105g/km by opting to pair this engine with the Dualogic automatic gearbox. The other diesel engine in the 500L range, the 1.6-litre Multijet diesel, manages 67.3mpg and 112g/km of CO2. By far the worst of the bunch is the least powerful unit on offer, the 95bhp 1.4-litre 16v petrol unit, delivering figures that remind us how inefficient small car engines used to be - 46.3mpg on the combined cycle and 143g/km of CO2. What else? Well, there's a Smart Fuel System that does away with a fuel cap and makes it impossible to put petrol into a diesel model - or vica versa. And servicing? Well that will be needed on petrol units every 18,000 miles, but you can stretch that to 21,000 miles if you opt for one of the diesels. So, a compact MPV based on the underpinnings of a small family runabout. Nothing new there. Unless you apply fashionable thinking to the purchase of such a thing - in which case, this Fiat 500L remains a refreshingly different choice. It's certainly different from the 500 citycar we all know - but then of course, to suit the intended family role, it has to be. Not everyone will like the styling approach necessary to achieve this but it's surely one that sets it apart from rivals. A unique look, just as every 500 should have. Fun, cheeky and cool, this Fiat claims to suit the sort of people looking for a car to be an extension of their personality: a car that reflects their passion for life. We're not sure if any compact people carrier can really do all that but of all those available, there's little doubt that this 500L is the one that gets closest to hitting the mark. It's a sensible family car you can really feel good about.